This week long goalie camp runs from Monday June 26 - Friday June 30, from 9.30a.m. - 3.30p.m. at Delaware Park. The camp is open to boys and girls age 8-18 of all levels, House, Travel and Premier. Besides a week of excellent professional goal keeper training, all goalies will receive the goalie camp package, which includes a goalie camp shirt. At this age the goalies will be working on all the basic technical and tactical skills and build a solid foundation for the rest of their soccer goalie career. The focus in this age group is on improving the basic skills and abilities at a higher and more game like level. More attention will be given to skills that are necessary for goalie within the concept of the 11v11 game. This is the physically and mentally more demanding program for goalies that play at the Travel, Premier and High School level. The focus at this age group is on perfecting all technical and tactical skills. All sessions are game related and highly competitive. Coach Rudy has been organizing goalie camps and clinics in WNY for almost two decades now. He worked with many local and regional clubs and many house, travel, premier, college and pro goalies. Besides being the Director of Soccer with the Delaware soccer Club he also trains the goalies of Niagara University and was the goalie coach for the WNY Flash. He holds a USSF A and B license and the NSCAA National, Advanced National and Director of Coaching diplomas. During the camp Coach Rudy will be assisted by other specialized goalie coaches and pro and college goalies. If you have any questions or comment, please contact Coach Rudy Pompert directly at dos@delawaresoccerclub.com. The #1 Preseason Soccer Goalie Event in WNY! 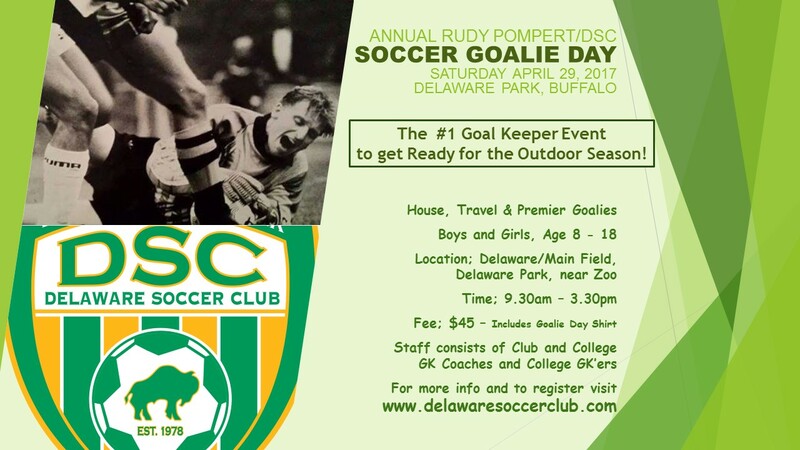 For almost two decades Specialized Goalie Coach Rudy Pompert has offered a Soccer Goalie Day to all soccer goalies in WNY to prepare for the upcoming outdoor season. Each year between 60 to 80 goalies take advantage of this great goalie event. During the morning all training is focused on technique training. The early part of the afternoon is all about falling and diving, while the second part of the afternoon is filled with exciting goalie games, such as Goalie War, Goalie Murder and Goalie Tennis. Coach Rudy will assisted by local pro, college and club goalie coaches and keepers. What is the Goalie Day? Goalie Training Day for Premier, Travel and House League Goalies. When is the Goalie Day? Where is the Goalie Day? Improve Game Tactical Skills and have a ton of FUN! All goalies will receive a Goalie Day jersey. To go to the registration page click on the REGISTRATION link at the top of the page. The DSC / Rudy Pompert Goalie Day is the opportunity for Western New York youth goalies to prepare for the upcoming outdoor season!